My son, like most four year olds, had a few specific items he wished for Christmas this past year. 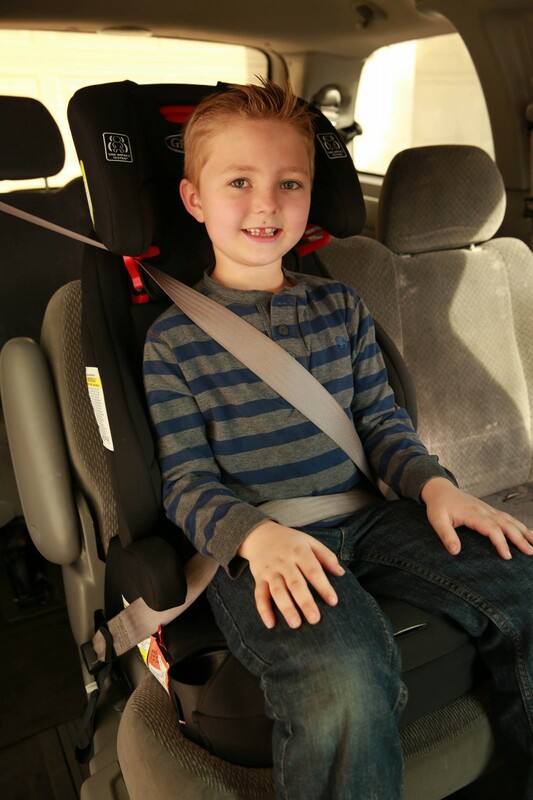 But unlike most four-year olds, he was pleased with his gift of a new 3-in-1 combination carseat, the Graco Tranzitions (the Tranzitions is also sold at Wal-Mart as the Wayz)! Carseats are not a regular gift given in our home, but it seemed appropriate this year for a few reasons. For one, his convertible car seat was going to be passed down to his little sister. Secondly, he needed a very narrow seat when a new baby brother boots him to the 3rd row between his two older booster-using brothers. And so, on Christmas morning, my four year was correct when he guessed that the oddly wrapped, chair-shaped package with his name on it was, in fact, a new car seat! Luckily, upon opening this unconventional and totally practical gift, the sleek all-black design, TWO cupholders and extra padding did not disappoint him! Forward-facing with 5-pt harness: 22-65 lbs. Tranzitions comes with harness strap covers and a lightly padded body cushion. There are no height or weight limits specified for use of these items in the manual so they can be used at the discretion of the child and caregiver. Tranzitions installed very well in all seating positions of my 2002 Ford Windstar using both LATCH and the vehicle seat belt, which has a lightweight locking latchplate (common in older vehicles). Tranzitions did NOT install well in the back seat of our 2002 Saturn; a position that has a lap and shoulder belt with switchable retractor. Installation seems to be hit or miss; be sure to hang onto your receipt and the box in case you need to return the seat if it doesn’t install well in your car. Smooth belt path; no digging around or getting scratched. 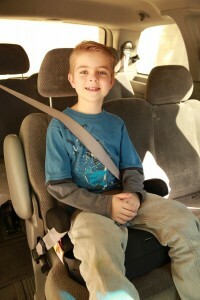 May need to remove/raise headrest to make car seat back flush with vehicle seat. Can be installed in harness mode using either lap-only or lap/shoulder seat belt. Always use the top tether when installing in harness mode. When using Tranzitions in booster mode you must use a lap/shoulder belt. Contact Graco if you need a locking clip for older vehicle without locking seatbelts; check instruction manual to see if you need one. 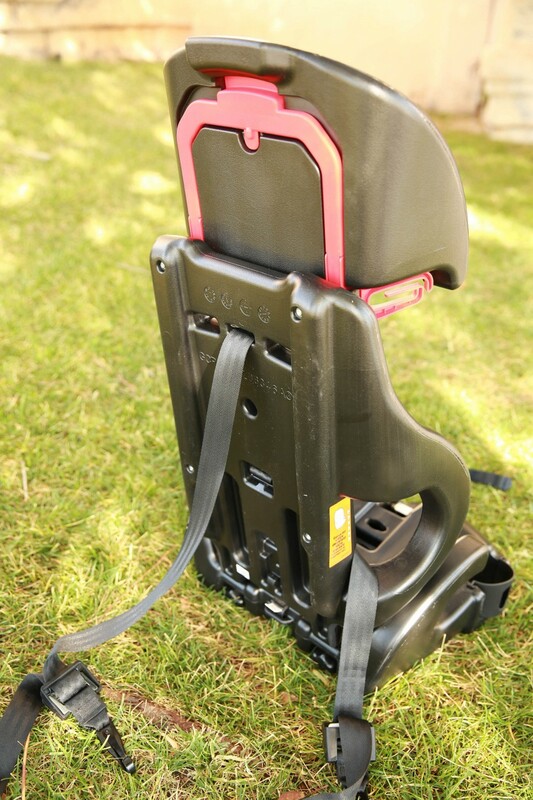 LATCH can be used to install Tranzitions in harness mode for a child weighing up to 45 pounds. For installation in harness mode for a child weighing more than 45 pounds, you must install using the vehicle seat belt and tether. Can secure seat with LATCH in high back booster mode (with child being secured with the seat belt). In booster mode secure seat with either LATCH or seat belt when not in use by child as a loose car seat can be hazardous to other passengers in a crash or sudden stop. Belt-positioning booster mode: No weight limit. Can secure Tranzitions using the lower LATCH strap and top tether while child uses seat belt for restraint. Graco does allow center LATCH installation where lower anchors are spaced more than 11” apart if your vehicle manufacturer specifically allows it. Check your vehicle owner’s manual for LATCH positions. 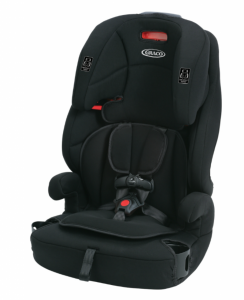 Graco has determined that the Tranzitions CAN be installed with inflatable seat belts found in some Ford Motor Company vehicles. 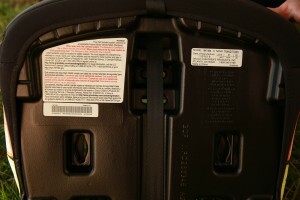 Other types of inflatable seat belts are still incompatible for use with the Tranzitions. There are no issues when using the seat as a belt-positioning booster. Tranzitions can be used in harness mode with children weighing 22-65 lbs and 27-49 inches. It fits smaller children well, but remember, kids under 2 should be rear-facing. 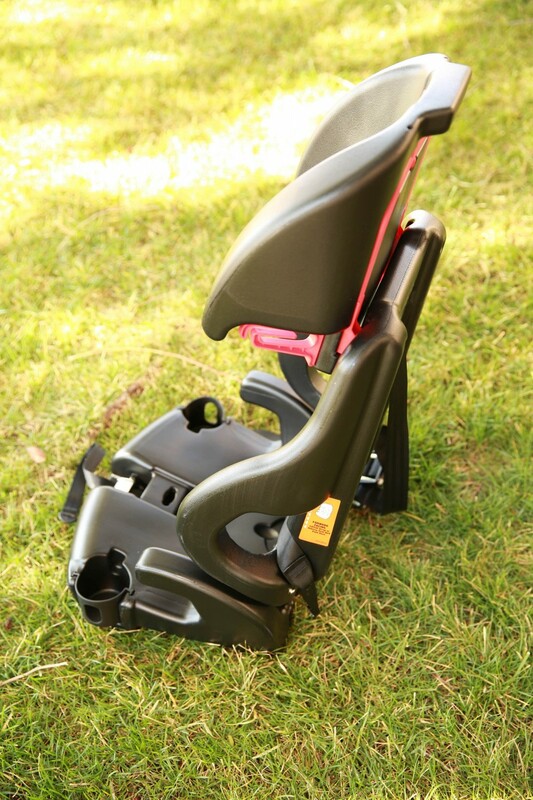 If your child is over age 2 and has outgrown their rear-facing convertible carseat, this is a great fitting seat now and will grow with your child! The no-rethread harness is incredibly convenient as you do not have to uninstall the car seat to move the harness straps higher as your child grows. Simply squeeze the red adjustment lever at the headrest and you can raise or lower the headrest, side wings and harness strap heights. One of the biggest selling points for me about the Tranzitions carseat is how narrow it is; allowing for multiple seats across a row. This seat rivals many high-end brand carseats known for their narrow footprint, but at a much more budget-friendly price. While the shell of the seat is narrow (17 inches at the narrowest point of the base) the interior seat width (at the most narrow point) is a comfortable 11 inches. It is plenty wide to accommodate my four year old in harness mode as well as my older children who could use this as a booster. For children between 30-100 lbs. and 38-57 inches this forward facing seat can be turned into a high-back booster. These low weight and heights are the absolute minimum for a child to be using this carseat in booster mode. A child is safest using the 5-point harness for as long as possible. 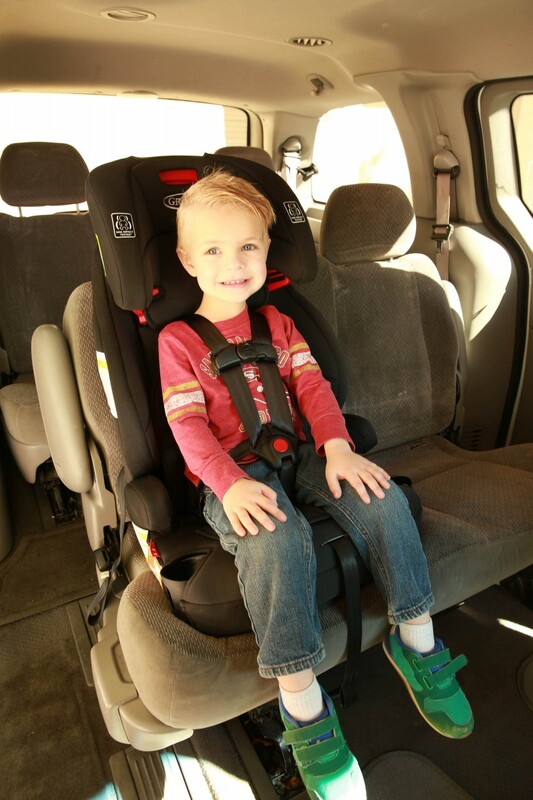 Once the child has outgrown the 5-point harness it is easily transformed into a high-back booster. 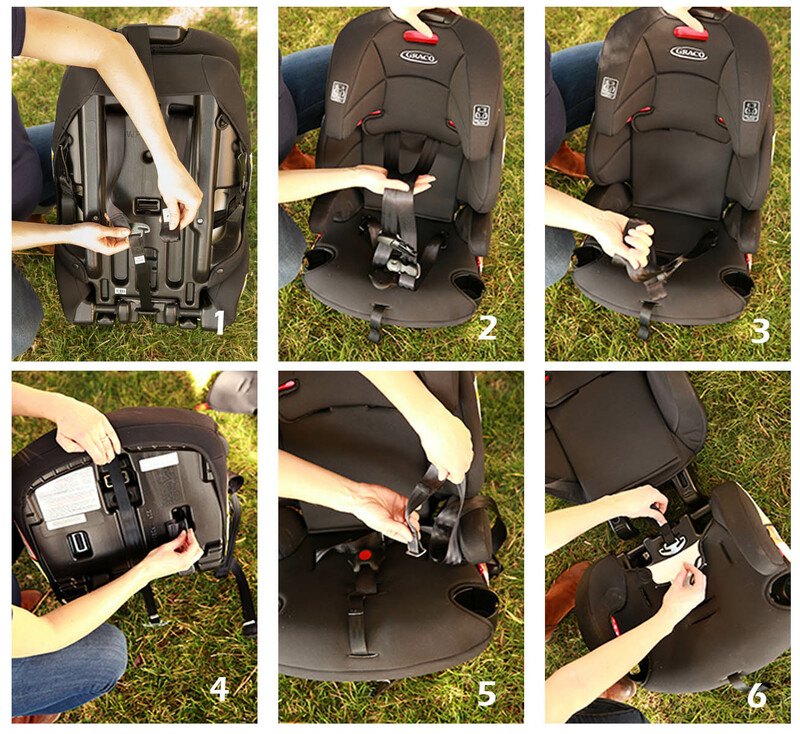 From the back of the seat, unloop the harness straps from the splitter plate on the harness adjuster strap then unthread the harness straps from the back of the seat through the slots to the front of the seat. From the two slots near the child’s hip, pull the metal H clips up through the hips to the front of the seat. The crotch strap is also easily removed by pulling the metal anchor up from under the seat through to the top of the seat. There is no on-seat storage for these items so find a safe place to store them for future use. Tranzitions features an open loop shoulder belt guide that is bright red and impossible to miss. It is a bit tricky for my kids but it is not at all hard for an adult to do. Since the guide holds the seat belt in place between uses, I can thread it for my kids one time and it is ready for them to strap themselves in every time. 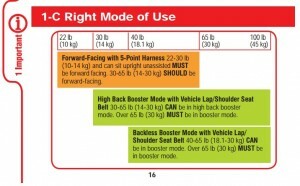 Graco lists the weight and height minimums and limits for the backless booster as 40-100 lbs. and 40-57 inches. Again, just because your child has reached the minimums does not mean they should move into a booster. 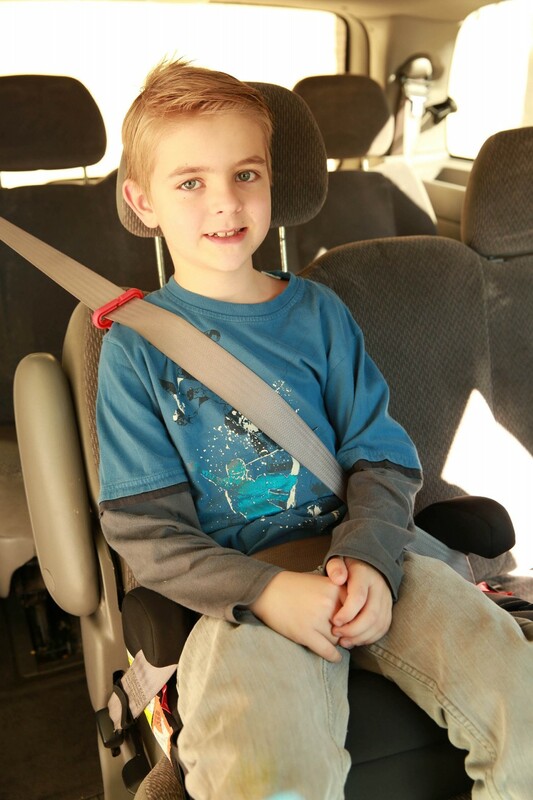 A child is safest riding in a 5-point harness as long the seat allows. 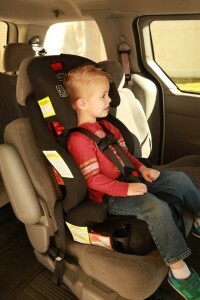 This seat is easy to turn into a backless booster when your child is ready. Simply fold the back of the booster toward the ground and lift the back up out of the seat gutter to transform the high-back booster into backless booster mode. Taking the back off Tranzitions makes the seat two inches deeper giving a long legged child extra thigh support. The seat comes with a removable shoulder belt positioning clip (if needed) to adjust the vehicle seat belt comfortably across the child’s chest and shoulder. Except for the body cushion, all the fabric components of this seat are made out of a material that feels much like a wet suit. Because it is such a smooth fabric it is easy to wipe clean but snags easily from velcro. If you need to do a more thorough cleaning than just wiping with a wet cloth or sponge the covers are all machine washable! Taking the fabric off to throw in the washer (and later remembering how to put it all back on) is not at all difficult.There are only two snaps securing the main seat cover to the upper shell and two hooks securing the seat cover to the seat shell. You can wash the fabric covers in the washing machine with cold water on delicate cycle and drip-dry. Do not dry in the dryer or use bleach. 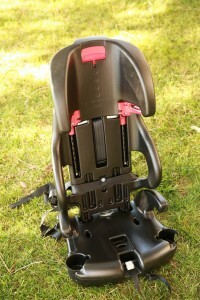 Without the cover, you’ll notice Graco did not use any EPS/EPP foam in the construction of this carseat. Instead they used a manufacturing process called “blow molding” to create the energy-absorbing hollow plastic shell. The blow molded headrest on Tranzitions has an interior and exterior wall with a void (air) between them. This design absorbs energy in a controlled manner very similar to having an EPS/EPP foam liner. Graco uses a drop test procedure that measures G forces to validate the effectiveness of this design. There were some typos in the instruction manual, which made me question how thoroughly the manual had been edited. But more importantly, the manual left me wanting for certain information I needed to know. 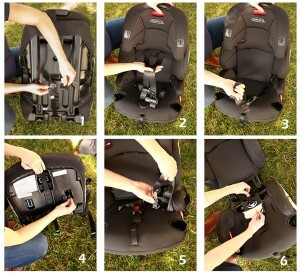 Such as: How to Assemble the Carseat! On page 47 of the instruction manual, in section 4-B Install Backed Booster Graco explains how to attach the back support to the seat, “Place Seat Back Hooks Into Gutters and Raise Seat Back.” It is literally two steps; lay the back support with the hooks in the slots of the bottom seat then lift the back support up to create a 90 degree angle. You will feel two small clicks confirming that the back is in the proper upright position. With the seat installed and supported by the vehicle seat there is no risk of the two parts separating. However, if you try sitting in the seat unsupported, like my son did, or more likely, try carrying the carseat through the airport, find a way to secure the seat as it can easily come apart. I would recommend using a luggage cart. 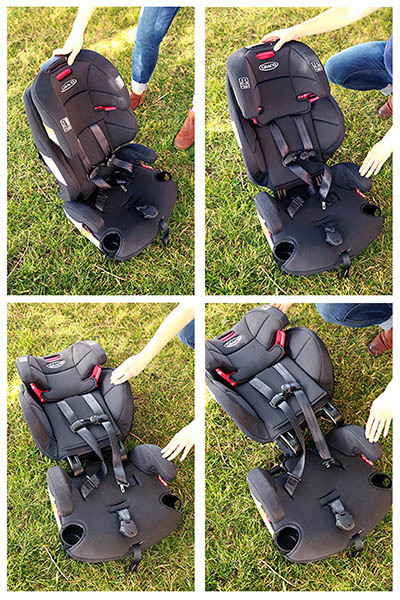 As lacking as the instruction manual was in some areas, it is a necessary reference for the proper use and installation of the carseat in its three modes. I appreciate that Graco sewed a pocket into the seat fabric for on-seat storage of the instruction manual. When used in harness mode Tranzitions can be installed in an airplane. It CANNOT be used as a booster on an airplane as a lap/shoulder belt are required for use. Expires 7 years from date of manufacture. Graco requires replacement after any crash. My decision to purchase this seat was based on three things: price, width and harness weight limit. For $129.99, this seat has some higher-end features like a no-rethread harness and narrow footprint. The width of the Tranzitions is right there, within an inch or so, with some of the most well-known narrow and very expensive carseats. I was looking to find a way to fit three kids across the 48 inch-wide back row of my minivan since, as I mentioned before, we’d be welcoming a new baby, causing us to reach the van’s 7 person capacity. So, with this narrow seat installed in the middle of the 3rd row, there remains 15 inches on either side. Plenty of space for two BubbleBum or mifold boosters (my 7 and 9 year olds are still trying to decide which they’d prefer). And finally this seat had the 65 lb weight capacity I demand from a 5-point harness carseat. So for $129.99 I got the narrow seat I needed and a 5-point harness that will last my four-year-old a few more years! THIS GIVEAWAY IS NOW CLOSED. THANKS FOR PARTICIPATING! Graco has graciously offered a Tranzitions to one of our readers! To enter, you MUST reply to this blog and leave a comment below (only 1 entry per household). For extra entries, be sure follow the Rafflecopter instructions to visit our Facebook page, visit the Graco Facebook page, and tweet about the giveaway! Please note: If this is your first comment at CarseatBlog, or if you are using a different computer/device or a new email address, your comment may not appear immediately. It will not be lost; it may just take a few hours for it to be approved. Thank you for your understanding and patience as this is the only way we have to reduce comment spam. The contest will close on Friday, 4/29, and one winner will be chosen within 72 hours. If a winner is deemed ineligible based on shipping restrictions or other issues or does not respond to accept the prize within 7 days, a new winner will be selected. Now for the fine print (these may be in addition to the rules listed in the Rafflecopter terms): Winners must have a U.S. shipping address to claim the prize. Only one prize will be awarded per winner. Winners will have their choice of available Graco Tranzitions fashions that are in stock at the time the promotion ends. You are not eligible if you have previously won a carseat or any sponsored giveaway at CarseatBlog.com during 2014 or 2015 (our own giveaways of goody bags and such don’t count if no sponsor was mentioned). Our blog writers and editors are also not eligible. Only one entry per household/family, please. If you leave more than one comment, only the first one will count. We reserve the right to deem any entry as ineligible for any reason, though this would normally only be done in the case of a violation of the spirit of the rules above. We also reserve the right to edit/update the rules for any reason. The contest will close on April 29, 2016, and one random winner will be chosen shortly thereafter. Thanks for this review! This will be my next car seat purchase for my almost 4 year old as his Maxi-Cosi Jool no longer fits him (not enough room in crotch and crotch strap too short even though he is well within the marketed height/weight ratings…seriously that was the worst seat I have ever owned). I wish I would have purchased this in the first place. This is comparable to the Britax Frontier, just $200 cheaper. Hi, yes there is. Almost all Evenflo seats are made in USA. 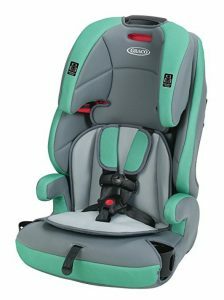 Models that are comparable to this would be Evenflo SecureKid or Evenflo Transitions (yes, almost the same name as the Graco seat but spelled correctly). Hey there I purchased two of these for my two sons who are 3 and 5 both 36lbs. I have continued them in the five point harness. Long story short had a friend ask about car seats so I sent them to your recommendation page which was where I found these I thought before but maybe it was a different page. I remember choosing these because they were recommended somewhere? Is that no longer the case or maybe I just misplaced the blogpost they were a part of comparing them to the other car seats. This would be amazing for my growing son! I didn’t know this seat existed until I saw this review on facebook. It looks like a great seat and I am very interested in it. It looks like it would fit great in the 3rd row of my Traverse. Graco clearly has their tiniest customers’ safety uppermost in mind, but have also taken family dynamics into consideration to create a seat that accomodates smaller cars, multiple car seats, transportability, etc. — thank you, Graco engineers! I love how narrow it is for three-across! Thanks for a great giveaway! This seat would be great to have. This is great! We are in need of a new seat for my daughter in my husbands car. I would love to win this carseat. Graco is all that I buy and I need a new one for my 1 year old so that his infant carrier can be used for baby when it’s born. I’d love to win this so I have a seat to keep my autistic kiddo harnessed for a long time. This seat has some great features! Would love to win for our daughter! Would love this seat as our oldest daughter moves to forward facing. This looks like a great seat! It’d be perfect for my 4 year old. I’ve loved every Graco product I’ve ever owned! Thanks for the chance! 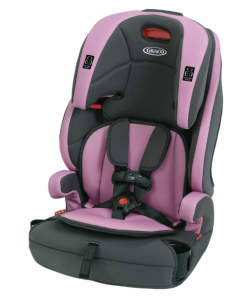 I have been doing a lot of research on car seats/booster car seats for my girls ages 3 and 4. I’d really love to win this one as it would be perfect to seat all of my kids on the 2nd row instead of having one child in the back by herself. This seat is so stylish and above all else SAFE! I would love it for my kids! I’d love one of these! Need something easy to adjust this summer as I’m nannying for 3 different families! Would love this for my son! My 3yo is quickly approaching the limits of her current seat rear facing. I would love to get her. Combination seat and pass her’s down to little sister. This one looks pretty nice! I need this!! My oldest is outgrowing his convertible, and I’ve been on the market for combination seats. I liked the Nautilus, but when I saw this, I had to keep reading! It fits the bill so much better than the Nautilus. I need something narrow for my Ford Escape since big brother is sharing the back row with little brother, and I wanted to have enough room for a seat for an extra passenger. The price point is also perfect! I’ve gone through a couple car seats already, so I didn’t want to be spending a whole lot on another one. Crossing fingers — I really hope I win this!